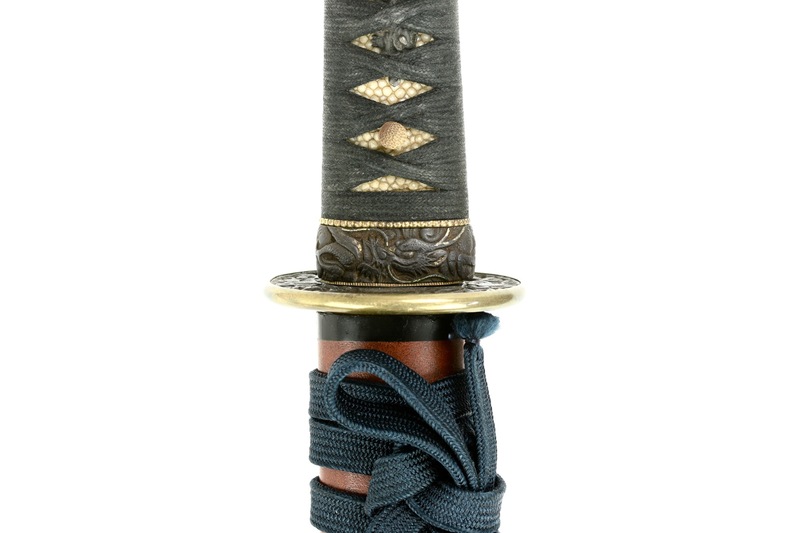 The Japanese sword is constructed in a way that its mountings can easily be interchanged. One only needs to remove a single pin from the handle to take it apart. 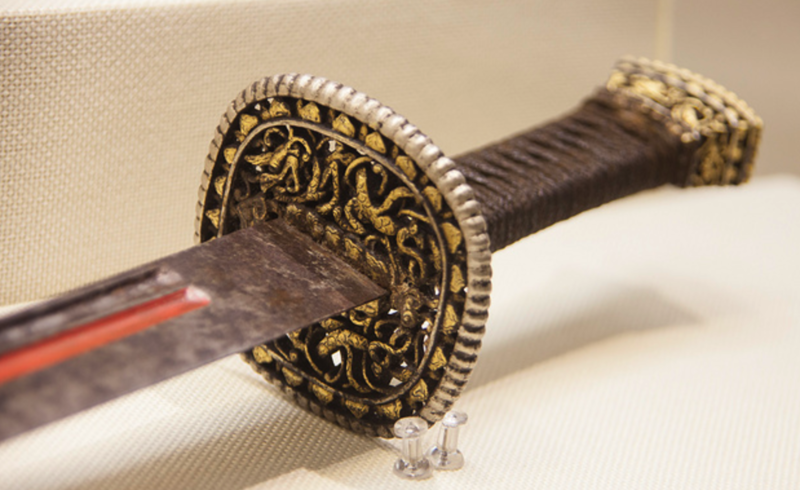 As a result, people often had several types of mountings for each sword and a sword, through the ages, got mounted in many different styles as fashions changed. 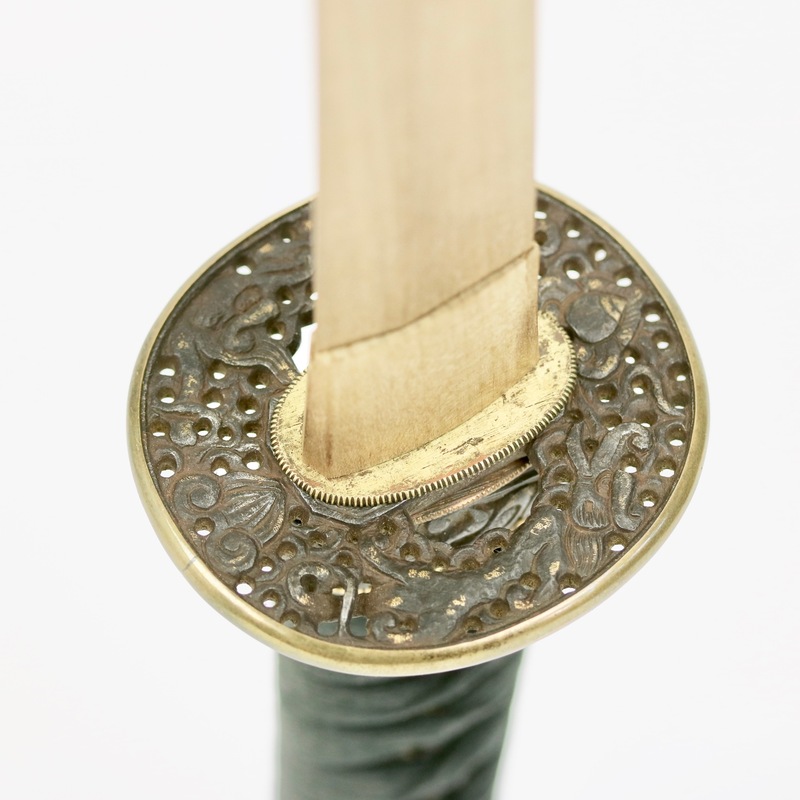 Because of this, the Japanese do not consider the mounts of a sword as an inherent part of the weapon, like other cultures with more permanently fixed mounts do. Judging a sword by its mounts, to them, is as odd as judging a master painting by its frame. So in Japanese culture, and there alone, there is a separate trade in blades and mounts with each their own collector's audience. 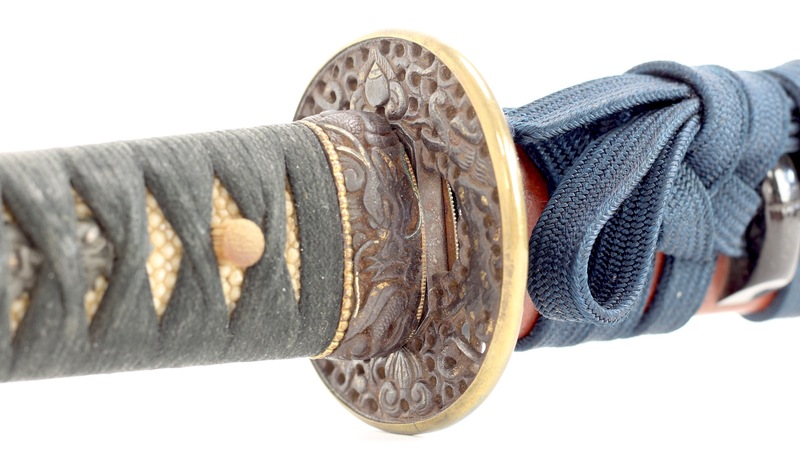 An antique blade is usually found in a resting scabbard, called shirasaya . 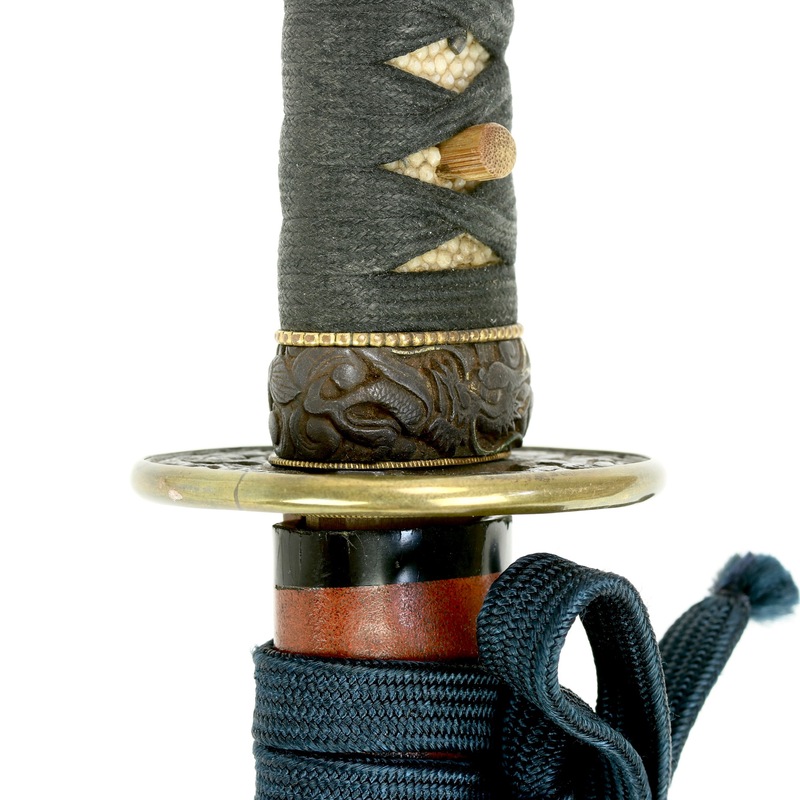 Antique mountings are considered a separate art and are appreciated, collected, and sold individually, as small sets, or as complete sets called koshirae . Origin: Japan, probably Hizen Province. Materials: Iron, wood, lacquer, copper, gold, brass, silk, ray-skin, bamboo. Dating: Late Edo period. Probably 19th century, some parts possibly 18th century. 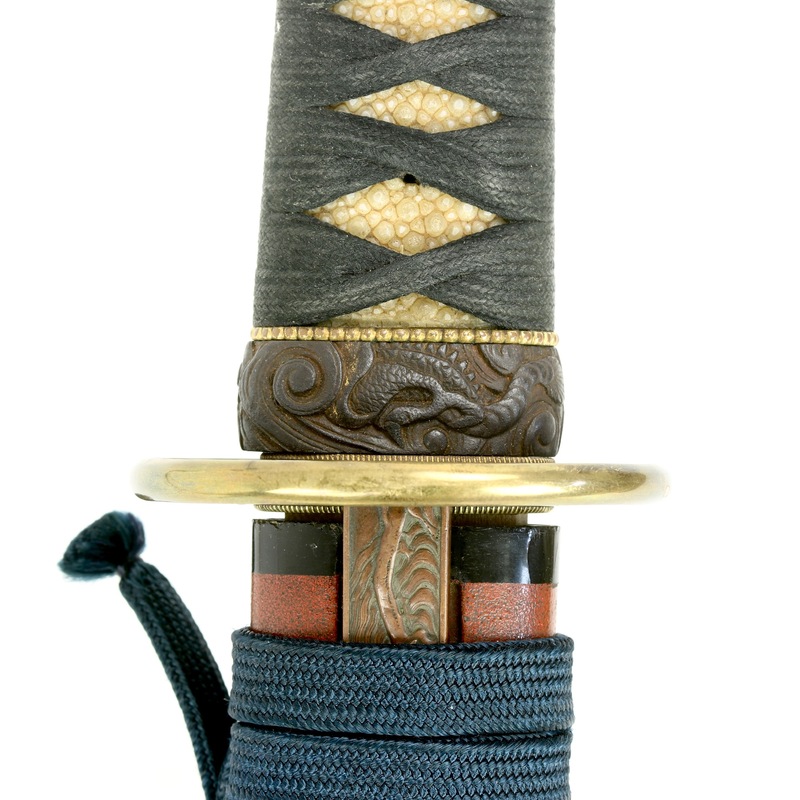 A Japanese set of mounts, handle and scabbard ( koshirae ) for a Japanese shortsword ( wakizashji ). 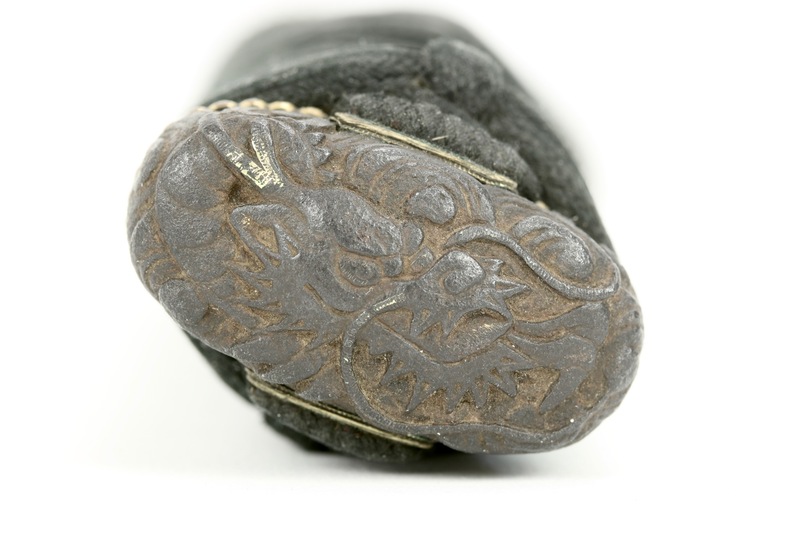 The handle mounts, consisting of a matching set of pommel piece ( fuchi ) and ferrule ( kashira ) with dragons chasing the "pearl of wisdom" cut in high relief. They are in a strongly Chinese inspired style that is referred to as nanban , literally "Southern Barbarian" because their ships typiclaly approached Japan from the south. 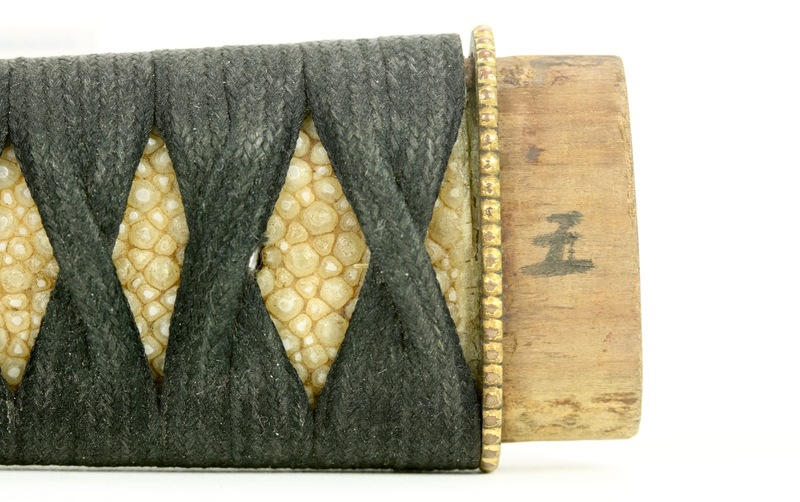 While sword guards ( tsuba ) in this style are not uncommon, fuchi kashira sets are very rarely encountered. I only know of very few here and there in private and museum collections. 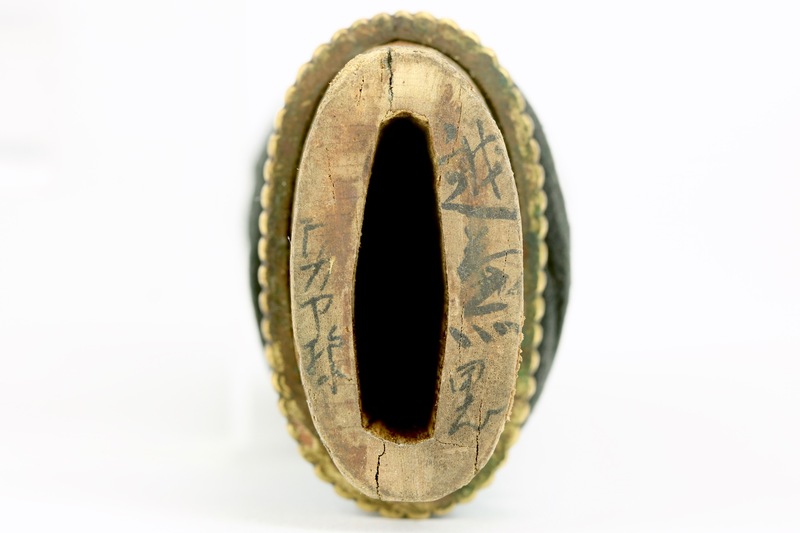 This set of fuchi kashira has a very unusual feature, in that each consists of two parts: The actual fitting and a separate beaded rim, made of copper which was subsequently fire gilt, leaving a thick layer of pure gold on its surface. 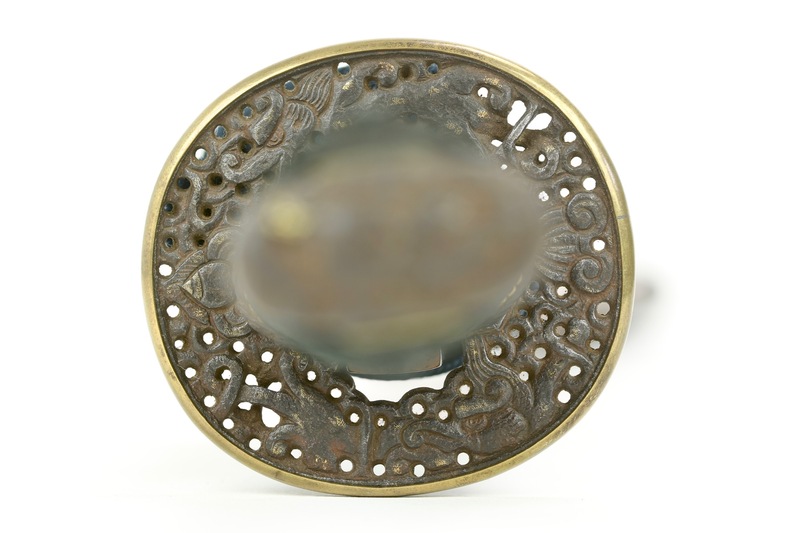 What few Japanese collectors would pick up on is that these rims are meant to emulate the style of beaded rims found on Chinese sword mounts, particularly those associated with the Manchu imperial clan of the 17th and early 18th centuries. 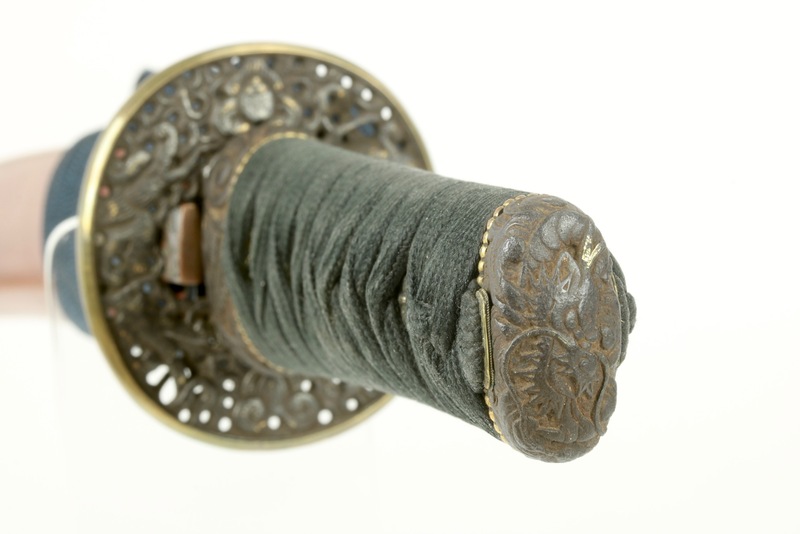 A close-up of the guard of a saber that was attributed to Hong Taiji who ruled from 1626 to 1636. 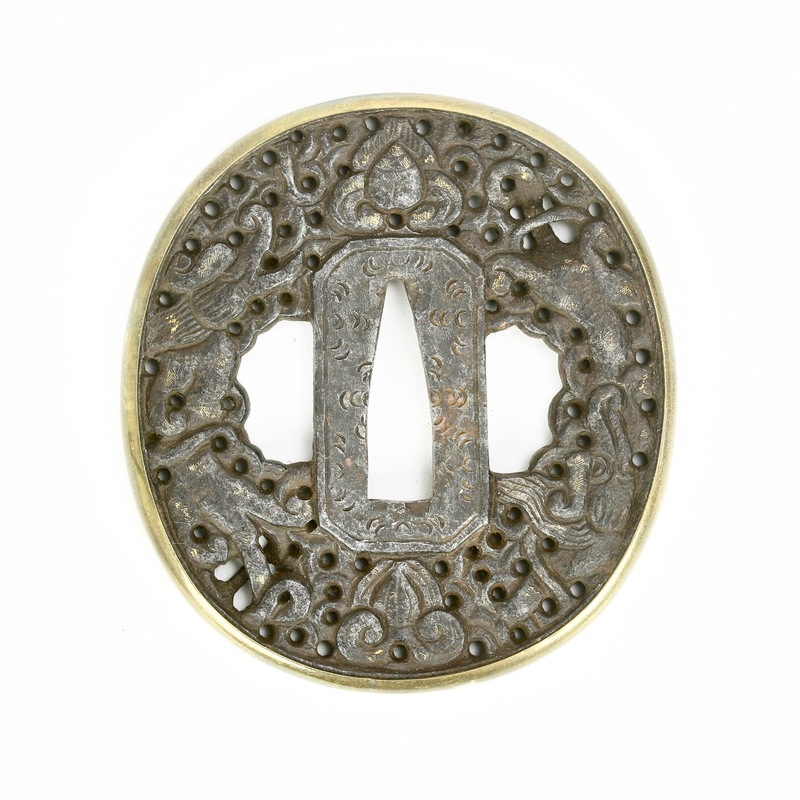 Now held in the Palace Museum in Shengyang. From: Baike.com. Notice the beaded rim. Guards like these were imported into Japan and gave rise to the entire genre known as "nanban tsuba" . 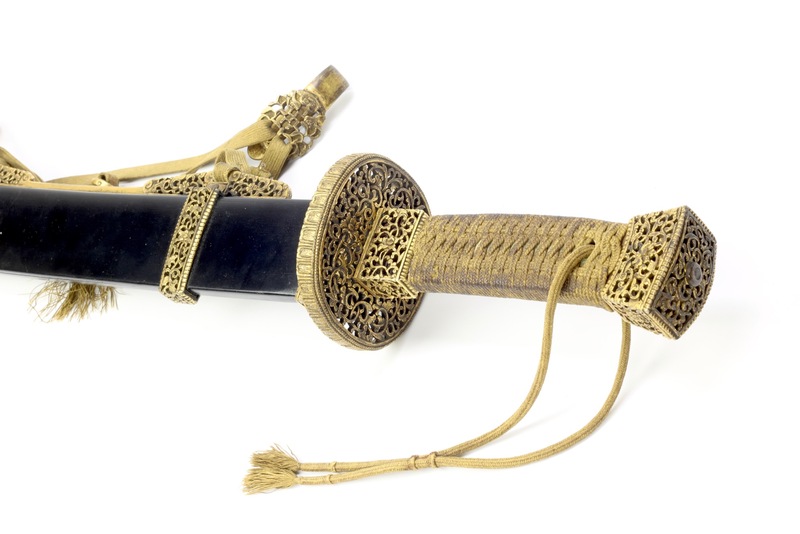 A Qing imperial saber of the late Qianlong period. 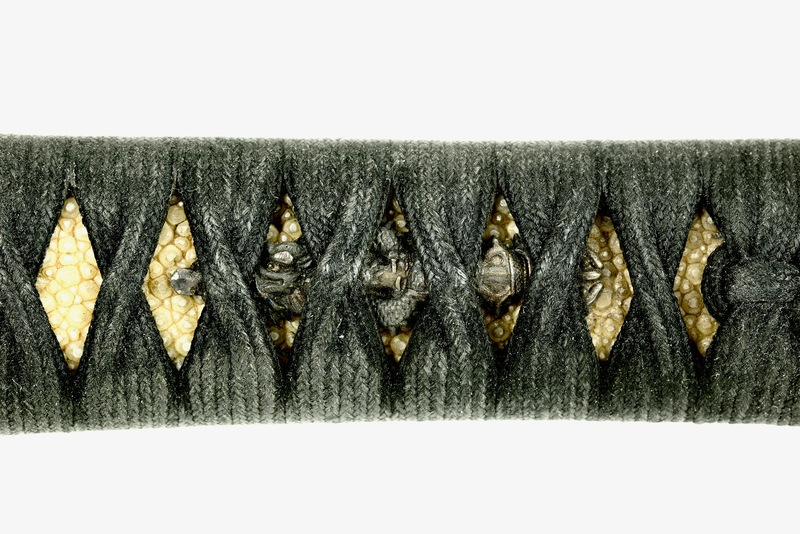 Notice the beaded elements at the borders of the scabbard and handle mounts. 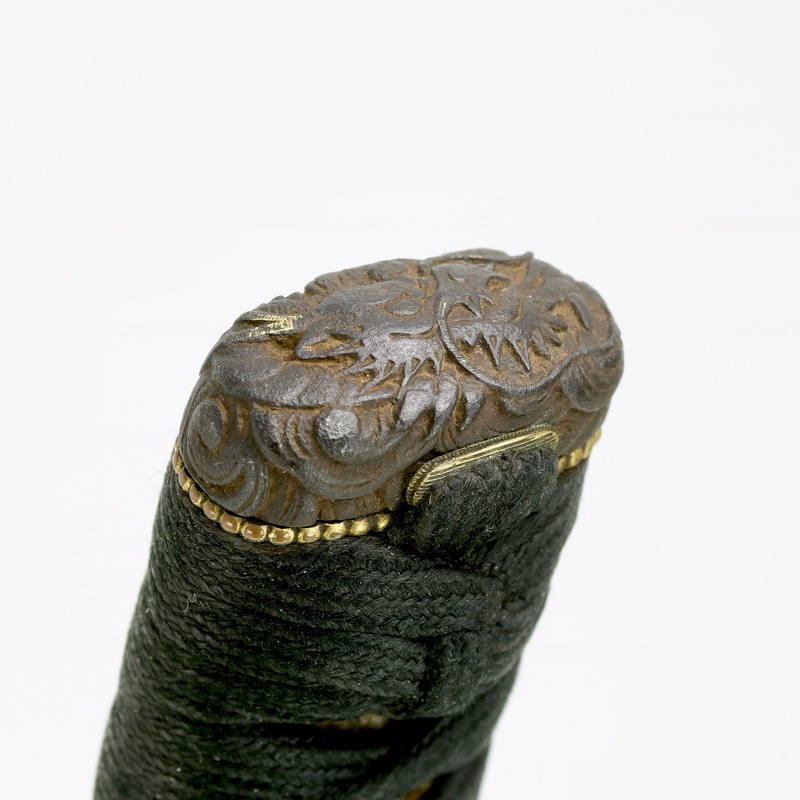 The handle is wrapped with what seems to be rough black silk. 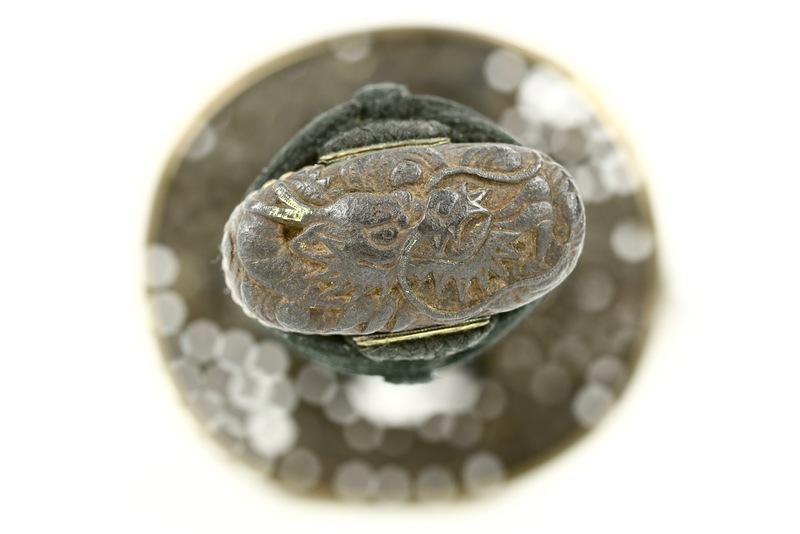 under the wrap are two metal ornaments, called menuki in the form of dragons coiling around straightswords. The guard is also in the nanban style, with the typical "Kanton style" decor of two dragons and a flaming pearl of wisdom. It has two areas of undercutting where one branche goes over the other with some space between them. It has a smooth brass ring around it. 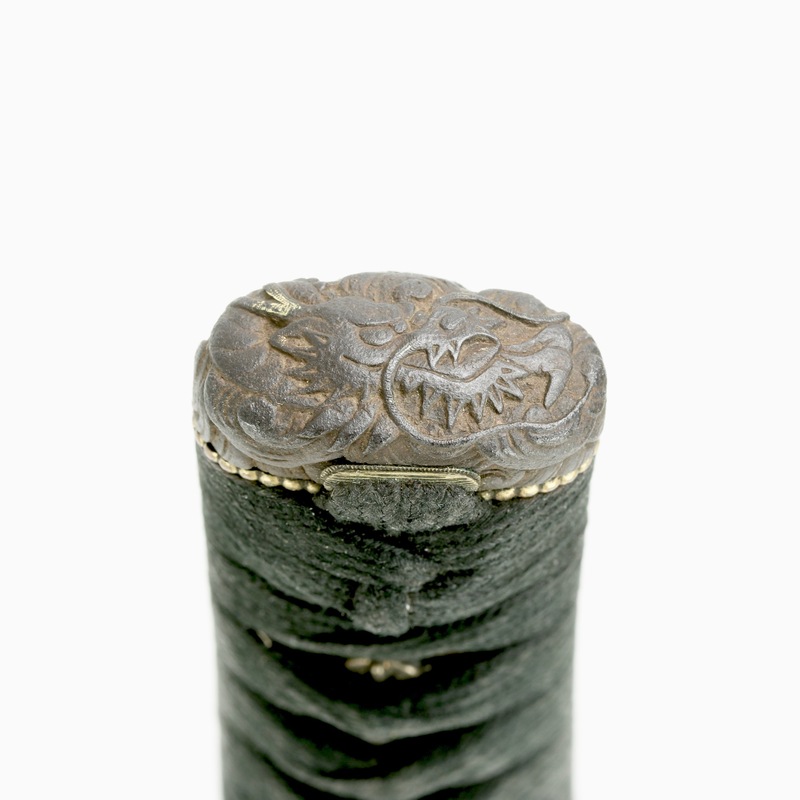 The red lacquered scabbard has a design of a black "water dragon" on it, an auspicious symbol in both China and Japan. The end fitting is a pretty heavy and seemingly solid piece of iron, with a subtle golden rim. It has the exact same patina as the handle mounts and was probably made together with them. It seems to grant the scabbard the opportunity to be used as a weapon in itself. 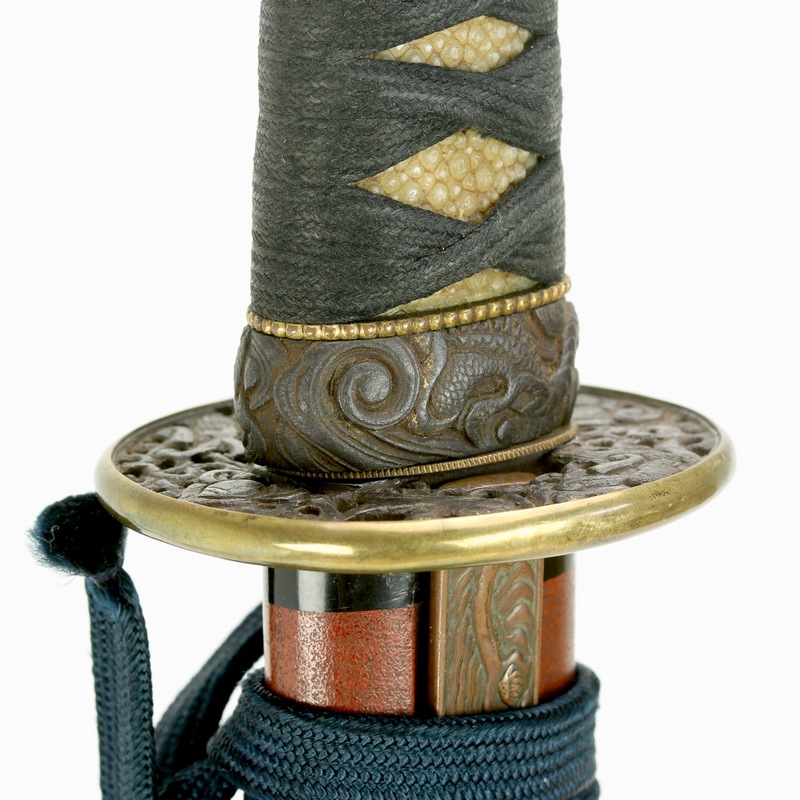 The cord wrap around the top of the scabbard, called sageo is of fine blue silk but is a recent addition to the ensemble. 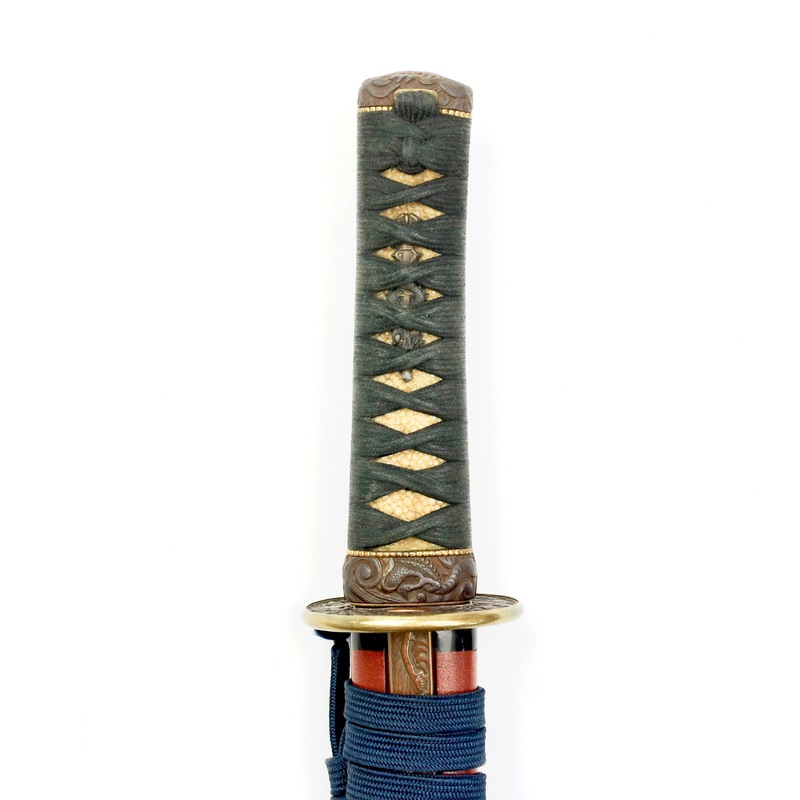 The set also contains a kogatana , a small utility knife with its ornate handle, called kozuka . It displays a scene rendered in copper of a Chinese scholar sitting in his studio, with a servant out with a broom, overlooking a natural scene. Many pieces of the "nanban" style are actually pieces made throughout Asia, often with the Japanese market in mind. Japanese makers later started to emulate or copy these designs. Judging from the overall style and workmanship I think all parts originate in Hizen, made by Japanese makers. Hizen historically had lots of contact with mainland Asia. 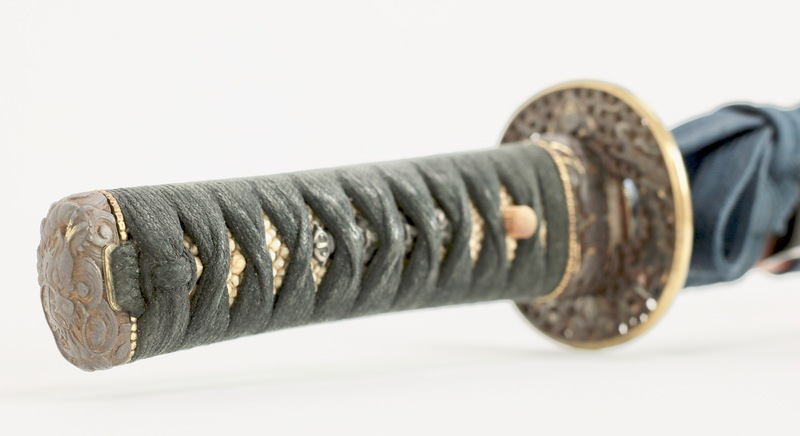 This set comes with NBTHK Hozon papers, which is a declaration that it is both authentic and worthy of preservation, issued Japan's main sword connoisseurs organization; the NBTHK. A rare set of koshirae with various mounts in the Chinese-inspired nanban style. 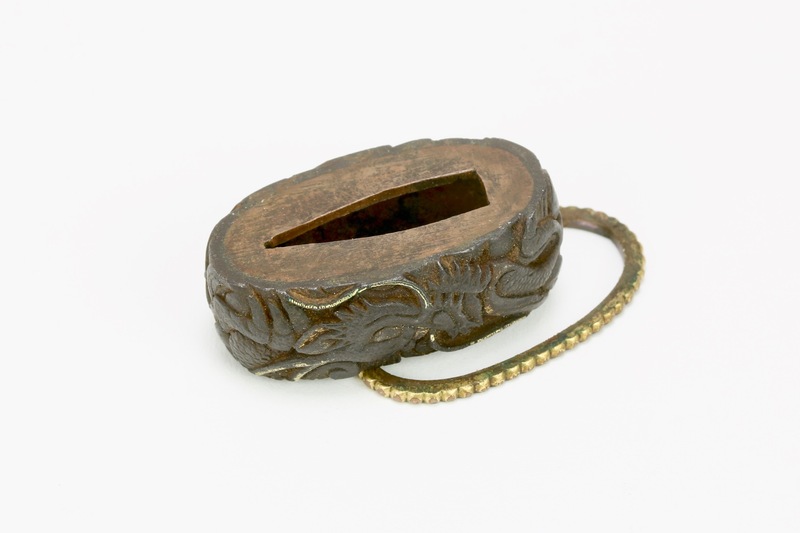 The fuchi kashira in particular are a great rarity, even by themselves. Their construction is rather unusual, with the separate beaded rims. Overall a nice package.